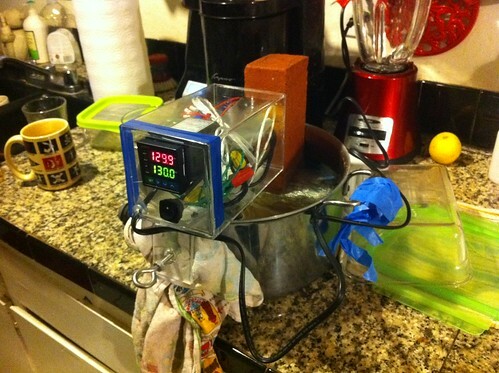 Sous vide device, a photo by aghrivaine on Flickr. This is a sous vide cooker that pyr8queen and I made for her mother for Christmas. Best laid plans of mice and men and whatnot, I just finally finished it today. Herself did most of the mechanical work, and I did the design and programming and troubleshooting. It really works! It circulates water, puts on super-hot heating coils and uses a thermo probe to turn the above on or off based on the temperature you set. So you put your food in vaccuum sealed bags, toss it in the water, and tell it exactly what temp you want - and it keeps it exactly at that one degree, no more, no less. There's worlds of stuff you can do with food when you prepare it like that. You can get an egg at exactly the consistency where the yolk is gooey. You can serve your steak at precisely, exactly medium-rare. You can make your tofu be just the right temp to be nice and solid, then sear it up for a crispy exterior. So many interesting projects. And it works! I'm psyched. And it only kinda-sorta-more-or-less-exactly looks like a bomb! My first reaction was: Why is Davy trying to blow up a pot of soup? Because, you know... Timer? Check. Detonator? Looks like it. Power source? Check. Brick of plastique? Check. Yep. Looks like a bomb.